The relationship between business and technological progress has always been deeply intertwined. From the earliest times, man has looked to machine to improve the efficiency of his work. This post looks at how accelerating advances in the domains of automative technologies are influencing the workplace in unequal ways, and how this could affect the work that you do. The Ancient Greeks were fascinated by automating machines (more explanation in this documentary) and throughout the ages there has been a curiosity in turning exclusively human actions into an automated form. More recently this has manifested not just in building mechanical structures, but machines which have a form of intelligence (more on this later). By this we are broadly discussing man-made inventions which act automatically and autonomously. The word “robot” first appeared in 1920 in the name of a play by Czech novelist Karel Capek. It derives from the Czech word for “slave” and tells the story of automated machines rising up against the human population. Since then, the word has been adopted not just by science fiction writers, but by those describing any way in which technology can act independently of humans. In the arc of homo sapien progress, learning how to create machines which could leverage the work of humans serves as a pretty steep turning point. At its core, a machine is taking a discrete series of actions and executing them in a superior manner to a human. Once the task of, say, spinning cotton can be done by a machine (which aren’t (as) affected by human error, constrained by moving at the speed of limbs, nor limited to a 10 hour working day) then the potential productivity vastly increases. Side-stepping the issue of whether the industrial revolution of the 1800s was good for humanity or not, progress in many spheres of society seem to stem from people learning to multiply the output of their actions with the assistance of machines. What’s been happening recently is that the complexity of task that a machine can do has been skyrocketing. Whereas the looms of the Manchester cotton mills still needed a high degree of human stewardship, technology has been developed to more or less remove the need for human intervention on the factory floor. Gut reaction would probably say that it is the low paying jobs which are most likely to be affected as technological capabilities increase. However it is not necessarily occupations that have traditionally required a university-level education that will be last to be undertaken by robots. 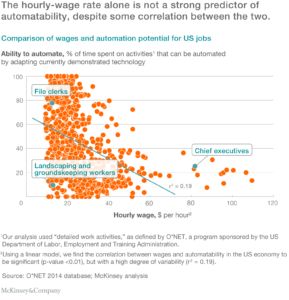 For the past few years McKinsey have published in-depth reports on the future of automation, and which industries are most likely to be affected. Whilst there is some correlation with wage and susceptibility to robots completing the task, it’s by no means perfect. The crux of it though comes with how predictable the specific tasks are within the job specification. If the tasks are predictable, they’re programmable, and therefore they can be automated. For example, tasks on an assembly line (such as food packaging or welding) have seen robots take their place, but those in construction or raising outdoor animals have less predictability and therefore still have human workers. It’s currently difficult for a robot to replicate a human in the food services arena (meaning waiting staff are likely to be in a job for a while) however the same might not be said of people who repeatedly clean and process data in a regimented fashion. Despite the latter being, in some cases, “more educated” or at least more highly paid. Things get more interesting when we consider cognitive tasks. So far we’ve spoken just about robots replicating the tasks of humans however the major development in the last 20 years (and rapidly more so today) has been in robots overtaking the capabilities of humans in that previously exclusive domain of thinking. There are many ways to view artificial intelligence, but a simple version is that it is a technology that can figure out the best answer on its own. An early version of this was computer generated chess. There wasn’t a human sat behind the computer directing each move it should take (unlike the Mechanical Turk…), instead the rules of chess were codified to the computer and it acted autonomously from there. For an entertaining, educational (and long) overview of the different forms of artificial intelligence, look to this piece on Wait But Why. 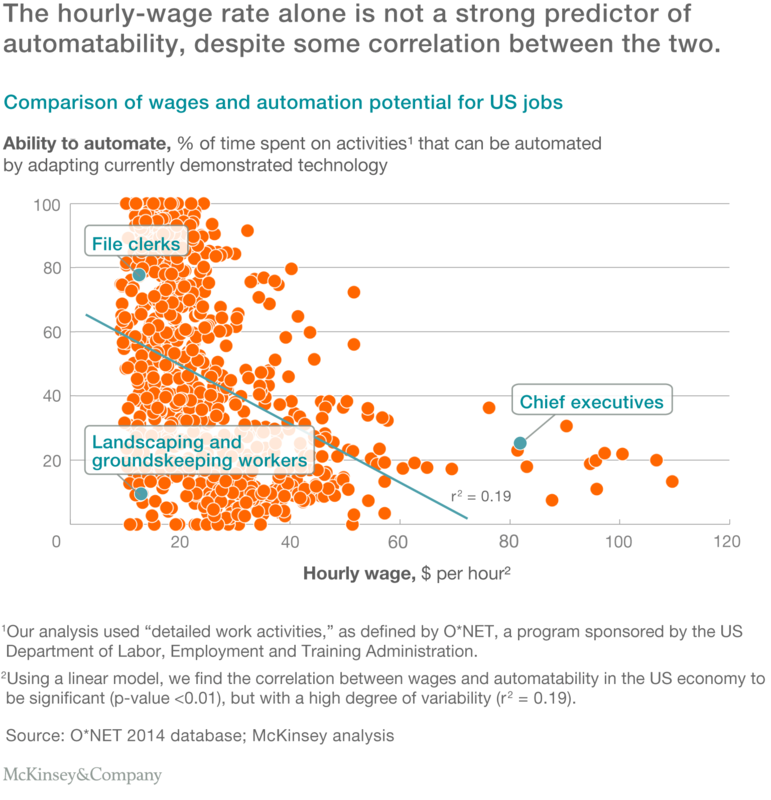 What does automation mean for you? In describing the various ways in which advancements in technology can assist or augment the workplace, it is useful to step back and see where you fit into the big picture. As, amongst others, the McKinsey reports state, not all jobs will be affected equally. The crux is to consider which of the tasks you complete could be automated as a result of their predictability. The thing which is considered hardest to automate is the management and development of people, and the application of expertise to decision making, planning, or creative work. Remember, if you have repeatable tasks as part of what you do, that means you could look to harness technology to improve your efficiency, freeing up your capacity to engage in higher level tasks. In any case, there is somewhat of an inevitability in the march of technology on the world of work, and so ensure that it features somewhere on the agenda for your next strategy meeting. Automation has been around for years (think of the Automated Teller Machine) however in the last few years the speed at which technology has been progressing has meant it has come knocking at the doors of jobs beyond just bank tellers. We’ve seen how predictability is a core tenant of whether a job can be automated, however the “self-learning” component to artificial intelligence means that even creative domains are seeing robots entering the arena. An unanswered question for society is that with all of these job functions being done by robots, what’s left for humans to do to earn a living? For that, take a look at our next post (out on 20th July 2017).